Gifts from the Pirates: "Friendship is a single soul dwelling in two bodies." "Friendship is a single soul dwelling in two bodies." I'm surprised we got this photo as even through he is a photographer Chris struggled with the ins and outs of a lens cap??? It was a great afternoon out and made a really nice change getting to see and feed the animals. Seth really enjoyed feeding the goats although got a little stressed at the one greedy one that was on a mission to empty out his bucket. I really enjoyed spending time with some adults as when your a stay at home dad some days the only people i seem to speak to are the boys especially during the summer holidays. The boys love them both too which is great and they think Seth and Opeie are great. As i mentioned in previous posts I'm not much of an animal person i especially despise horses, don't know where it has stemmed from but its here and here to stay. I did have a great time though and the boys loved it, what i lack in enthusiasm for animals Michelle definitely makes up for 5 times over. She loves all animals and they all seemed to warm to her too, im shocked we managed to get her to leave she was in her element. Mrs M was happy she got to see some sheep, its quite often i catch her at home flicking through her copy of Beautiful Sheep that i brought her a few Christmas's ago. Seth even got to ride on one which as you can see from the picture he was pretty chuffed about. 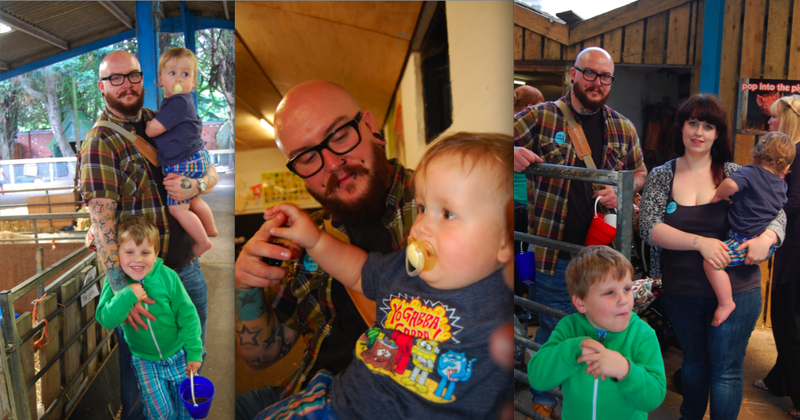 He was almost as excited when he got to milk a wooden cow., cant beat a bit of faux farming. Opeie wasn't a great fan of the noise though and got a little upset, it was fairly busy to so must have been a lot for him to take in. We were asked if we wanted to hold a chick, but after Opeie Hulk smashing my xbox last week i thought it best to avoid any nasty accidents. Seth on the other hand was more than happy to have a little chick sitting on his shoulder (i love Seth's expression...'I'm really comfortable, Honest'). After the farm we headed back to Chris and Michelle's and had some lovely food and as usual some great conversation. They even surprised the boys with some gifts which was really kind of them and i will be writing about them separately. I got to have a good rummage through Chris's toys which was one of the things i was looking forward to the most (have a read of his post "Life's like a movie, write your own ending...") and then we headed down the park. This park was amazing and Seth was totally blown away by the fact that he finally got to have a go on a zip wire, he always talks about wanting to go on one and since doing so it's all he has talked about at home. Apparently we have to take him back within 20 days? i have no idea why 20 but he was very direct with his point. So it looks like i better do as I'm told or there might be trouble. Even the grown ups got to play around and i was pleasantly surprised that Mrs M went on the zip wire too. I don't know who enjoyed it more her or Seth. It was a fantastic weekend, spent with 2 amazing people. Thank you so much guys and I'm sure we will be coming to see you again very very soon. Thanks for telling everyone about the lens cap incident! We had a brilliant time too, was great to see you all again and really pleased Seth had a good time at the park - you'll be more than welcome to return within 20 days! Thanks to you and Mrs M for the gifts too, and for the wonderful homemade cheesecake, that quickly got demolished! See you guys again very soon! Glad you enjoyed the cheesecake, i was made one last night with a peanut butter base! lush.